VoiceFinder AP-LMR2000 LMR(Land-to-Mobile Radio) gateway is a new cutting edge LMR gateway supporting maximum 4 ports of radio interface with two(2) module slots. 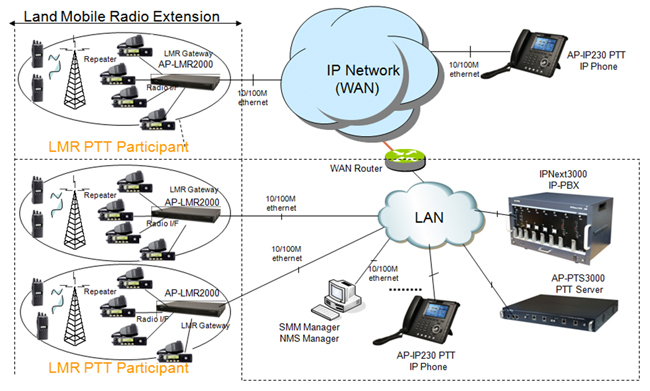 Radio and LAN interface of AP-LMR2000 provide an optimized call scenario for RoIP (radio over IP) service when it interoperates with conventional radio device. Compact cost effective design and system architecture of AP-LMR2000 provides customer satisfaction in high quality, performance and system reliance. This product uses the state-of-art technology voice compressed algorithm and unique QoS algorithm of AddPac to maintain the maximum Radio over IP voice quality under fast internet line and slow internet line as well. VoiceFinder AP-LMR2000 LMR gateway provides high-performance radio over IP(RoIP) solution for military, and police as well as fire station and construction area. LMR(Land-to-Mobile Radio) gateway combining IP-PBX, PTT Server, IP Phones for PTT service is now suggesting a new model for a main RoIP(Radio over IP) communication solution.In order to be a part of advanced RoIP communications naturally in the future, making an excellent choice of choosing LMR gateway is essential. 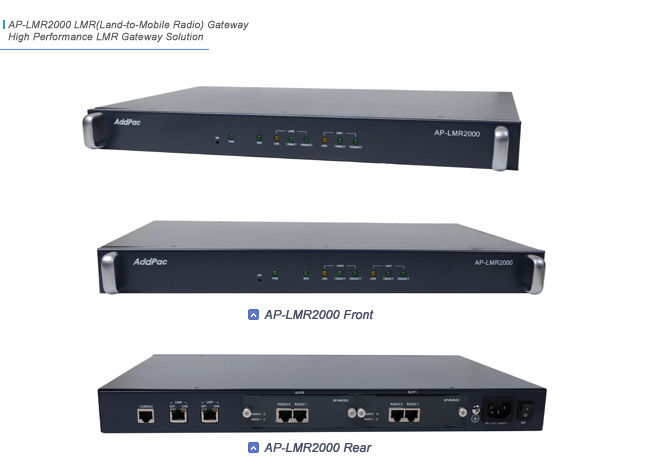 AP-LMR2000 is a mid-range LMR gateway providing two(2) radio interface module slots. It is suitable for general enterprises, small and public offices. It has functions as a LMR gateway which interoperates with radio device between IP network and radio network. Especially AP-LMR2000 provides an optimal solution of RoIP communications in telephony environments that using PTT Server, PTT IP phones and IP-PBX to get connect with a head office. Various LMR gateway series of AddPac is approved for its high performance and reliability in world wide markets. AddPac provides highly advanced LMR services in order to meet demanding and evolving business requirements of customers. Especially AP-LMR2000 LMR Gateway has been developed through years of experiences and accumulated know-how from existing enterprises and communication markets. AP-LMR2000 provides concurrent dual signaling stacks such as H323, SIP and QoS (Quality of Service) for high quality of communication service. This will satisfy customers with high expectation. IP Accounting, and Debugging/Diagnostics, etc. WAN Protocol Point-to-Point Protocol (PPPoE for ADSL), etc. Since SSL 2.0 is insecure it is not supported. TLS 1.2 is supported but disabled by default. Support for TLS extensions: server name indication, max record size, opaque PRF input, etc. Support for authentication using the SRP protocol. Support for authentication using both X.509 certificates and OpenPGP keys. Support for TLS Pre-Shared-Keys (PSK) extension. Support for Inner Application (TLS/IA) extension. Support for X.509 and OpenPGP certificate handling. Support for X.509 Proxy Certificates (RFC 3820). Supports all the strong encryption algorithms (including SHA-256/384/512), including Camellia (RFC 4132).